Arsenal Football Club was born when a group of workers at Dial Square armaments factory in Woolwich decided to form a football team to break the monotony of factory life. 125 years on, the club is still serving the community in Islington with supporters across the UK and now around the world. 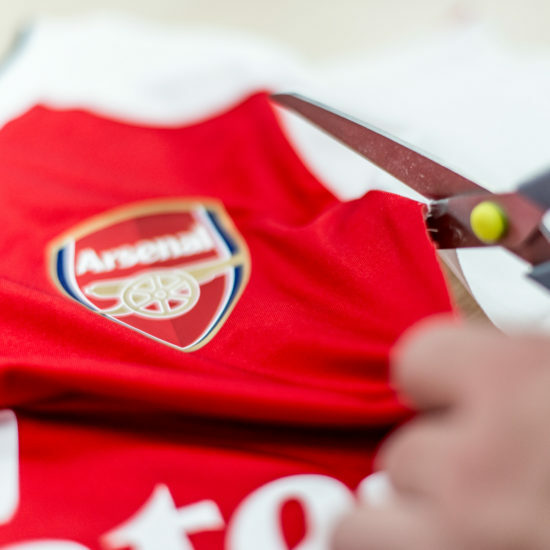 Yes, that’s Alexis Sanchez’s match shirt being cut up right there. Don’t worry, we had a cunning plan; what if not just one lucky fan owned this shirt, what if it could be shared by hundreds? Traditionally the shirt would be framed and hung on a wall but what if we could embed fragments of the shirt in a range of products to be used and enjoyed by many, at a much more accessible price? After frenzied product development, we perfected a method of laser profiling fragments of shirt and encapsulating them into elegant merchandise. A fan could now watch a game one week and pick up a unique piece of club history the next. 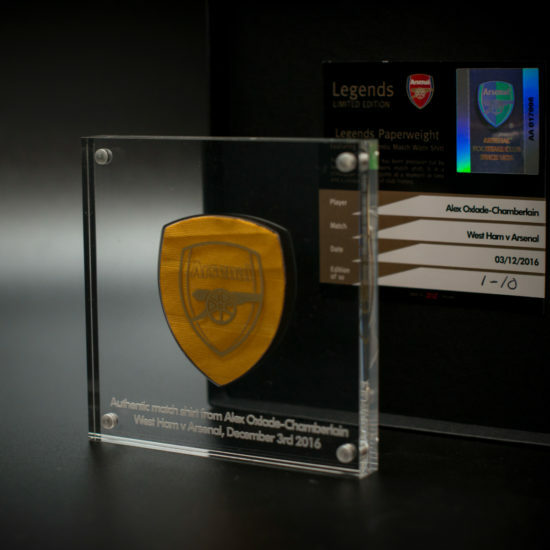 To authenticate the product, we laser engrave each piece with a limited edition number and a certificate identifies the precise venue, date and fixture the shirt was won. Shirts arrive with us “fresh” from the field of battle. This means they retain the blood, sweat and tears of the player, along with turf stains from the ground. It doesn’t get more authentic or more personal. We obsess about detail. 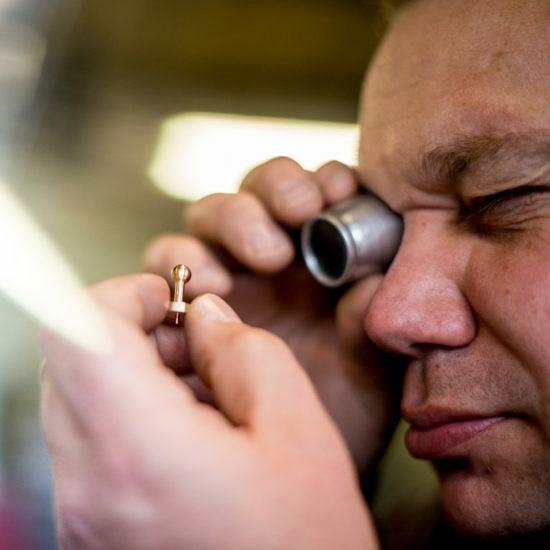 Take for instance these cufflinks, lovingly machined from solid brass by master craftsmen in their Cambridgeshire machine shop; that’s eagle-eyed Colin in the picture, he’s even more quality driven than we are. We bond the shirt fragment into a recess in the front, then laser a limited edition number on the rear. Simple, elegant and collectable. This executive paperweight is a real statement piece fit for an important study or office desk. The paperweight features a shirt fragment profiled between chunky machined blocks of polished acrylic. The piece can lay flat or stand upright depending on your mood. This keyring is designed to appeal to a younger audience looking for an accessory with real bling appeal. It’s smart cast metal body is shield shaped to compliment the Arsenal emblem. And the subtle satin plate finish provides a cool frame for the limited edition shirt fragment. 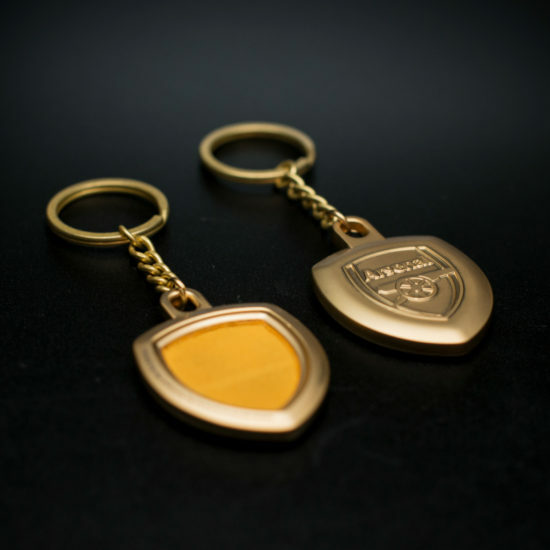 When the Legends range of accessories was first launched on the Arsenal web store it received spectacular levels of traffic from frans around the world showing that there is always room for something relevant and different.